Papier-Mache is an art which dates back to China's Han Dynasty, around B.C. 2002. Making papier-mache involves dipping torn strips of paper in a glue solution and applying to a surface, or making a clay-like substance with pieces of paper mixed with a glue solution. 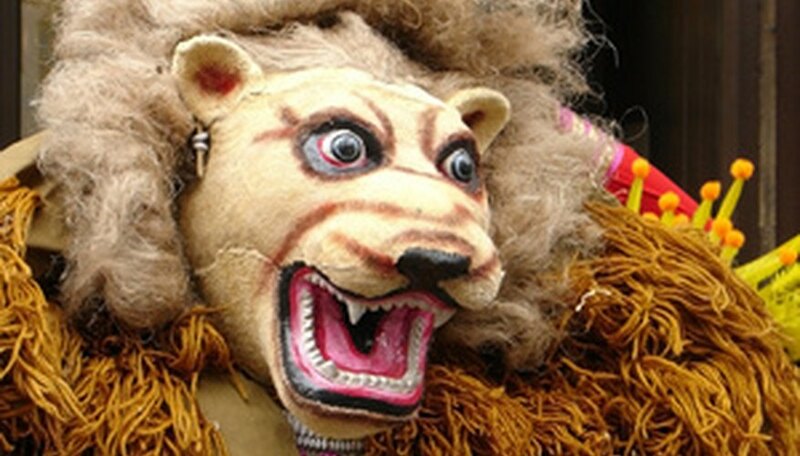 Items sometimes made from papier-mâché include, pot lids, helmets, coffins, furniture, figurines, piñatas, masks and more. Inflate a large balloon. Select a balloon that will be slightly larger than the head of the person, for whom the mask is for. Tear newspapers into thin narrow strips, about 6 inches long. You will need enough to cover the balloon three times. Dip a strip of the torn newspaper into the liquid starch and remove the excess liquid. Lay the wet newspaper strip on the balloon and smooth down with your hand. Continue adding strips, in a crisscross pattern, until the balloon is covered. Allow to dry, and cover with two more layers, allowing the wet newspaper to dry between each layer. Cut the dried, covered balloon in half, lengthwise, using a sharp hobby knife. If the balloon is still inflated, be prepared for it to pop. Once cut in half, you have the base to make two animal masks. The inside of each balloon half, is the backside of the mask. Add features, such as protrusion for noses or cut pieces of paper for ears, by taping the pieces onto the face of the mask. Cut out the eyes (and mouth if desired) using a sharp hobby knife. Cover the face of the mask and any additions (such as protrusions for the nose or paper for ears) with strips of newspaper dipped in the liquid starch. Completely cover. Allow the mask to dry before painting with acrylic paint.